The Children’s Africana Book Awards (CABA) program is celebrating its 25th anniversary this year. 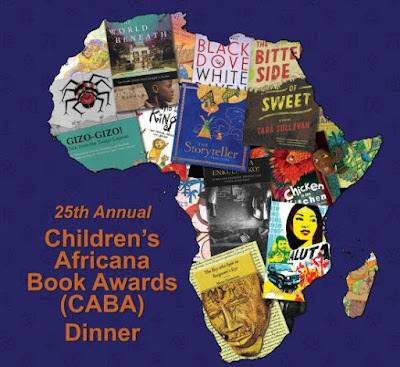 CABA awards are presented annually to the authors and illustrators of the best children’s and young adult books on Africa available in the U.S. The awards were created by Africa Access and the Outreach Council of the African Studies Association (ASA) to encourage the publication and use of accurate, balanced children’s materials about Africa. Over the past 25 years, CABA has recognized 90 books for children and older readers. Reviewers read 30 to 40 books a year, nominated by publishers and copyrighted in the year preceding each awards ceremony. Books must be available in English in the United States. The number of awards varies each year depending on the quality of what has been published. In addition to honoring a total of 90 books set in 24 countries, the Africa Access’ website (africaaccessreview.org) provides scholarly reviews and criteria for evaluating books. St. Francis Hall 1340 Quincy St., N.E. 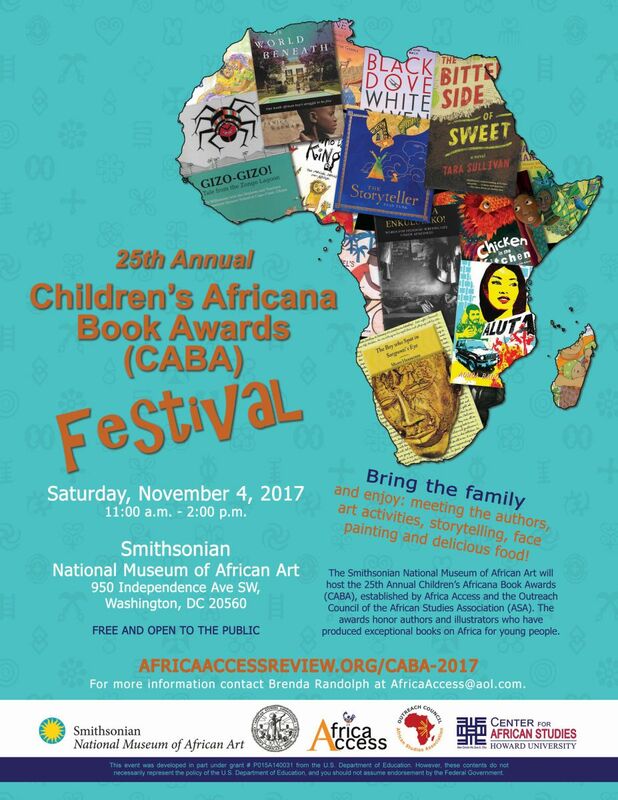 On Saturday, a free CABA family festival will be held at the Smithsonian National Museum of African Art, 950 Independence Ave SW, Washington, DC. From 11:00 a.m. – 2:00 p.m. children can learn to spin a yarn and weave a story, based on tales from Ghana, Morocco and Ivory Coast. A panel of CABA authors/illustrators is featured from 11:30 – 12:30. Current and past CABA winners will be signing their books after the panel discussion. The museum is also opening its newest exhibit, Visionary: Viewpoints on Africa’s Arts. The event is free and open to the public. Registration is requested. Saturday November 4 for the CABA Festival. Free and open to the public.